The Fubon Guardians started their third week posting three consecutive wins on board and currently in the third place with a 0.500 record. With a relatively slow start, it seems like the Guardians’ pitchers are becoming more efficient. Unfortunately, that is not the case for 陳仕朋 (Chen Shih-Peng). On March 29, Chen started against the Brothers and allowed five earned runs along with five hits in only 1.2 innings. From looking at the surface, his performance might not be able to secure him a spot in the starting rotation, but if we take a closer look at his single innings performance, you might find something interesting. The 22-year-old lefty tossed a perfect three up three down inning in the first but allowed seven base runners in the second inning which led to Chen being pulled out of the game early. This phenomenon has happened again and again throughout Chen Shih-Peng’s career. On March 29, 2018, Chen allowed five earned runs in 2.1 innings against the Monkeys. Although he went through the first inning with only one walk, he was completely out of control giving up seven hits in the next 1.1 innings. The only “outlier” was when he recorded a six innings scoreless start against the Monkeys during the end of last season. We included the video highlight below. Take a look at the table below of Chen’s career since his debut in late 2017 season. We listed down the box of Chen’s starts while splitting the numbers into first-Inning and afterwards. Chen appeared in nine games in his young career and started eight times with a 0-4 record, 8.71 ERA and 2.03 WHIP. In 2018, he tossed 27.1 innings within six starts and finished the year with a 47.7 ERA+. 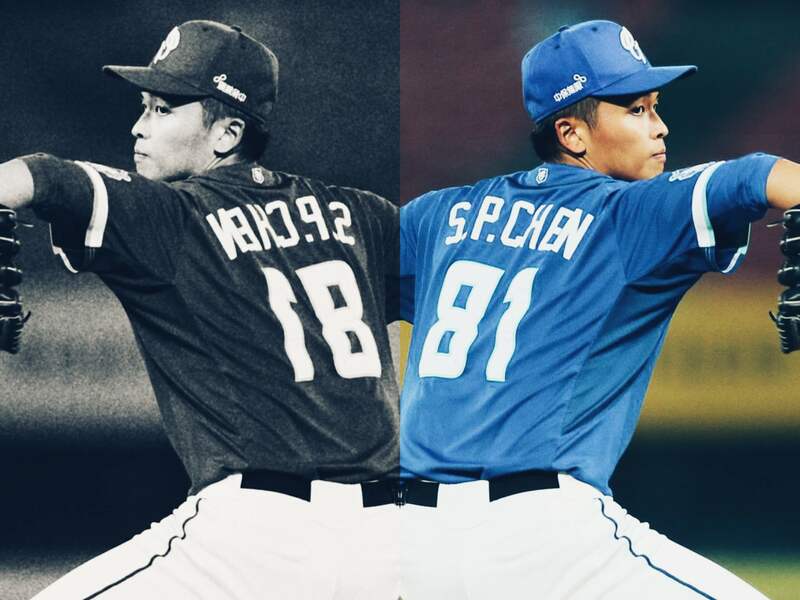 With this unique phenomenon, Chen recorded a 2.25 ERA and a 1.00 WHIP in his career first-innings pitched, along with a league average 16.13 K% and a 12.9 BB%. In contrast, the 10.29 ERA and 2.38 WHIP after the first inning are extremely not eligible. See the table below with Chen’s pitching stats in the first and after the first, along with the league average in 2018 season. Furthermore, Chen has quieted the batters with a .154/ .258/ .269 remarkable numbers in the first innings. Unfortunately, the 1.085 OPS after the first innings is way above the league average. See the table below with Chen’s opponents batting stats in the first and after the first, along with the league average in 2018 season. 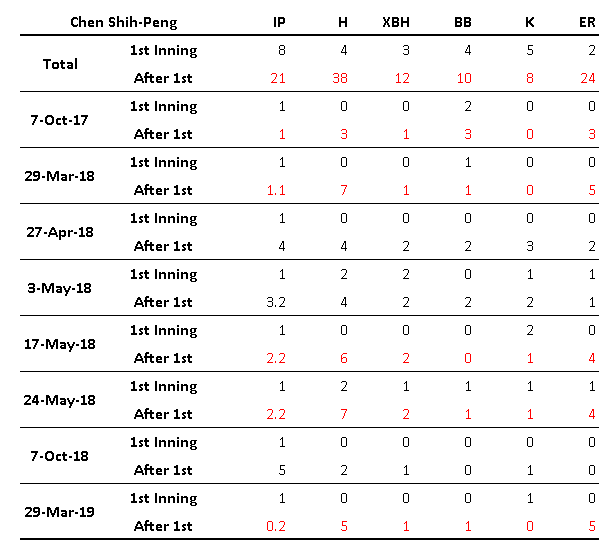 According to the statistics, inserting 陳仕朋 (Chen Shih-Peng) in the starting rotation might not be the best choice for the Guardians. Would it be possible to make Chen an “opener” who only pitches the first inning of the game? Currently, with the Guardians veteran pitcher Mike Loree still on the disabled list, the coaching staff might not have enough players in the depth chart to follow up Chen’s start. We look forward to seeing how the Guardians’ manager Chen Lien-Hung would optimise his pitchers’ usage. Mark Lin is from Taiwan, who is currently studying at the City University of Hong Kong. In his spare time, Mark enjoys reading and researching about all things related to baseball analytics.